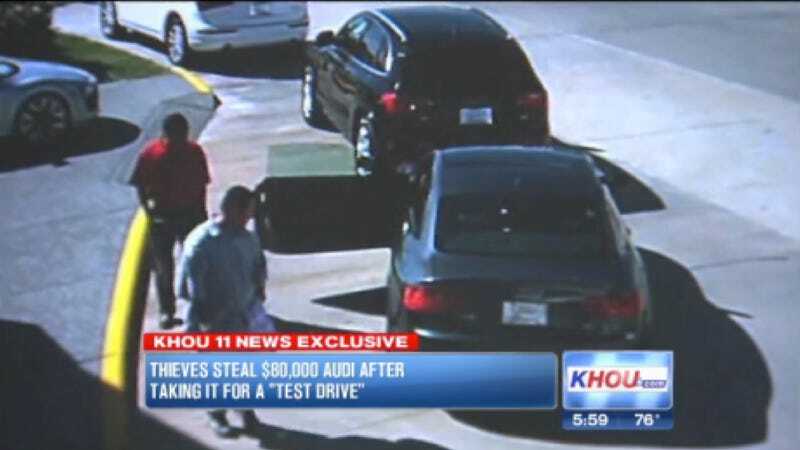 A Houston Audi dealership is down an RS5 after two guys stole it right off the lot following the dumbest plan to steal a new car we've ever heard work. Thankflly, the whole thing was caught on camera. KHOU reports that the two men who took the Audi last week pulled up to the dealership in a white Range Rover (which may or may not have been stolen, as well). They looked through the whole lot of cars, including looking at an R8, before picking the RS5 to take a test drive in. When they came back, they sat with a salesperson like they were going to do a deal. But after the employee got up, the two guys took the keys to the RS5 and all of their IDs and took the Audi. The sales manager, interviewed by KHOU, was kind of in awe of the guys' slick plan and said, "This is not their first rodeo," which is in no way an Isuzu reference. Naturally, the dealer is frustrated because they just have some descriptions of the guy, but not much else to go on. The phone number they left, "it was to a collection agency of all things," the sales manager said. The dealer is offering a $5,000 reward to get the $80,000 RS5 back. Houston police would like a word if you know anything about this crime. Thanks for the tip, Alfonso!